I always drive past this restaurant when I’m in the Munising area and have always wondered about it, as the sign outside is quite catchy. 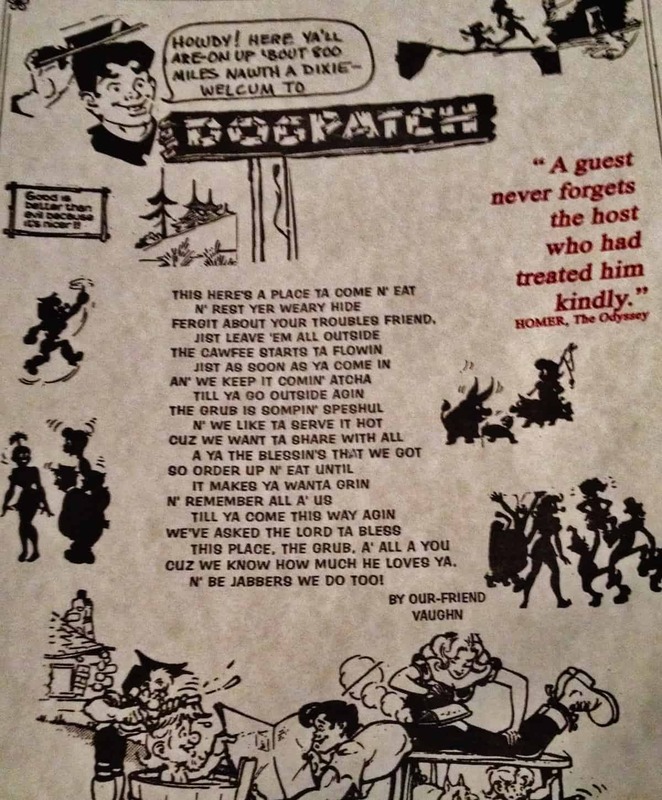 I’m happy to report that I finally got the chance to visit the Dogpatch Restaurant last month and was fully satisfied. The signs welcome you to have some good, home-style southern cooking and as I love some southern potato salad and a good burger, I had to stop by after a long day of hiking around a snowy Pictured Rocks. The interior of this establishment is inviting and very southern, right down to the red checkered table clothes. I felt right at home. The menu is full of options for everyone: from sandwiches to burgers, and steaks to fresh caught fish. This restaurant is a family restaurant where the children will be satisfied and adults can sit down and relax. I know that my burger and salad bar (with perfect southern potato salad) hit the spot for me. And after you are full and satisfied, they have a gift shop attached with all those touristy trinkets you know you want to take home for relatives. Bottom Line: This is not a fancy place, as you can tell by their sign advertising “vittles fer fine folk”. It may be a bit cheesy on the outside, but the delicious food will fill your stomach and give you a little taste of the south up here in the north. Tagged Dogpatch Restaurant, Munising, pictured rocks, restaurant, upper peninsula. Amanda Schreiber is a Marquette based writer / photographer and student at Northern Michigan University.